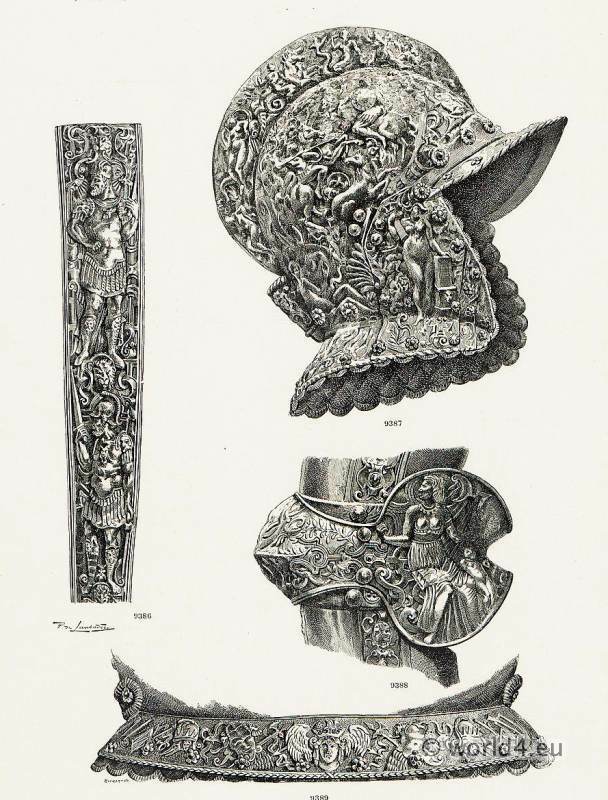 16th Century - German armor art. Home » 16th Century – German armor art. 16th Century – German armor art. Renaissance weapons. Armeria Real Madrid. Armor Blackened Material Steel facade facings. The second blade of braconnière, we see on one side, the right, the lion of Leon, left, eagle two feasts of the house of Austria. In 9387, the burgonet of the same armor, in 9386, the eiselée that adorns the back of the armor, in 9388, the cubitiére and, in 9389, the guard kidney. Sur la deuxième lame de la braeonnière, on voit, d’un coté, à droite, le lion de Leon; à gauche, l’aigle à deux fêtes de la maison d’Austriche. En 9387, nous donnons la bourguignotte de la même armure; en 9386, la eiselee qui orne le dos de la cuirasse; en 9388, la cubitière, et, en 9389, le garde-rein. Gallery: Offensive and defensive armor and weapons. This entry was posted in 16th Century, Germany, Military, Renaissance and tagged German Military Costume, Renaissance fashion era, Weapons on 1/7/14 by world4.